Best video editor apps for Android device - Record video that is quite easy but when we talk about editing video, naturally became its own discussion. A good video editing applications able to turn a boring video into the video interesting and exciting to watch. This application comes with several features such as themes, filters, video effects, titles and transitions as well. The application also comes with several features such as: capture modes with several options like slow motion, fast motion, music video and FX. But the application has deficiencies, any video that you create will be marked with a watermark. If you want to remove the watermark in the video that you create, you can obtain the version of the premium is priced at $2.99. There are many themes that you can choose in the paid version. VidTrim is a video editing application that is specifically made for your android device. This application offers multiple features such as video trimming, video conversion, frame grabbing and many more. Upload your video creations result into social media sites could take quite a long time especially if the file is large. VidTrim can adjust the video resolution that you create so that the size of the resulting video becomes smaller. VidTrim provided with Lite that allows you to set the resolution of the video you've created. So if you often upload videos thou handiwork into social media, VidTrim could be an attractive option. If you are looking for a best android apps to make a video especially for this app instagram, could be an option. VidStitch video editing applications combine photos and videos in a single frame which you later can you share in your account instagram. More amazingly, you can also add a background sound in the videos that you create. VidStitch provides over 50 frames that you can select. You can also set the size of the width, color and degree of contras. VideoShow best android is an application for editing video that allows you to combine photos and videos. This application comes with several features such as voice to video recording, multiple text to video with video effects, timing, music, trimming, and also exporting. Edit video with VideoShow can be done easily even by beginners. The good news, any video that you create will not be marked with the watermark. Have you wondered how you can change the photos and videos that you have become an exciting new video. KlipMix allows you to combine photos and video with the background of your favorite songs into a video. This is the best video editing application for editing video standard with features like trimming, merging, splitting, and transcoding. The application also allows to add text, song or even a video effect. All the standard features you need to edit the video exists in the rest of this. 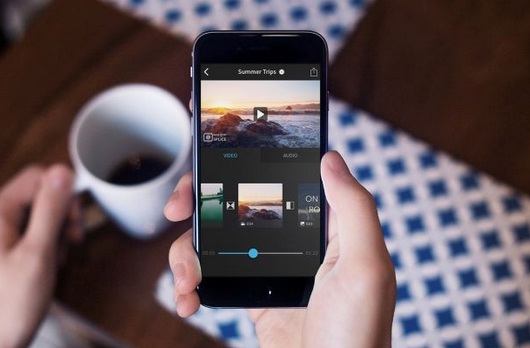 You can edit videos either from you or from your smartphone with high quality video. Ye added voice in the video application you, and you can share it directly. You can also set the video settings you be private or public. All video files you create and share are in this application server so that you can edit at any time and wherever you want. In some cases, the time duration of the video you create may not match expectations. Maybe you just want to display a small portion of the video that you already created. By using Video Cutter, you can cut part of a video you've created with ease. You simply set the start and end time of the video will you edit and cut. VidCutter supports a variety of video formats ranging from 3gp, avi, mpeg, mp4 and WMV. There are a wide variety of video formats that exist today, in some cases, the video that you want to try android gadget you don't run well. By using a media converter, you can convert the video files you want to play into some of the choice of video formats such as mp4, 3gp, avi, mpeg and FLV. You can also make other settings such as the audio sample rate and resolution. More great again, you can convert video files into audio files. In some cases, the duration of a video that you created may not match expectations. Maybe you just want to display a small portion of the video that you already created. By using VidCutter, you can cut part of a video you've created. You simply set the start and end time of the video will you edit and cut. VidCutter supports a variety of video formats ranging from 3gp, avi, mpeg, mp4 and WMV.